I love beetroot but my husband doesn’t. Not sure about my anklebiter because I’ve actually never offered it to him (save for in cake, see below)… the shame. Nevermind, they say it ‘only’ takes 15-20 times of offering a kid his age a new food before you can really be sure they don’t like it….. Anyway, I understand how some people don’t love beetroot. It has a strong earthy flavour and I think if you don’t pair it with other strong flavours, that earthiness can be overwhelming. A bit like buckwheat can be without a lot of tartness to sharpen it up. But be prepared and there are so many delicious ways to eat it. 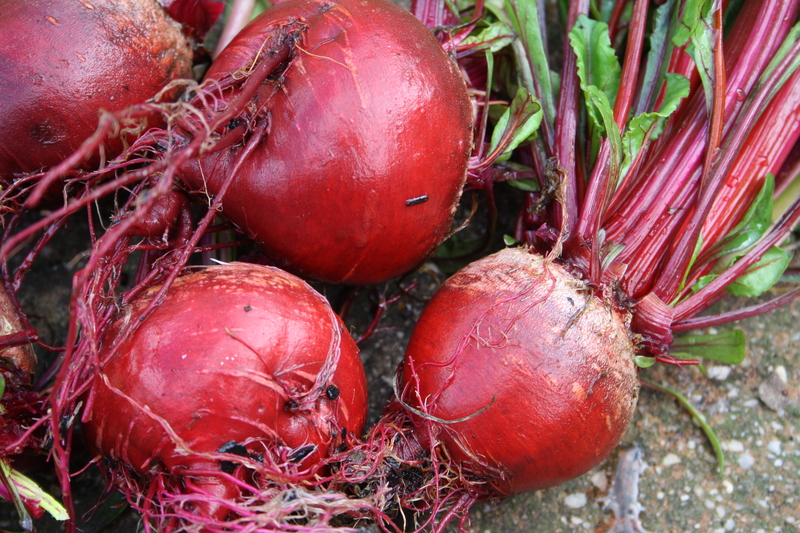 Beetroot has its best mates in the kitchen just like any other ingredient. Just a reminder about why to grow this crop at home: it meets all the criteria! 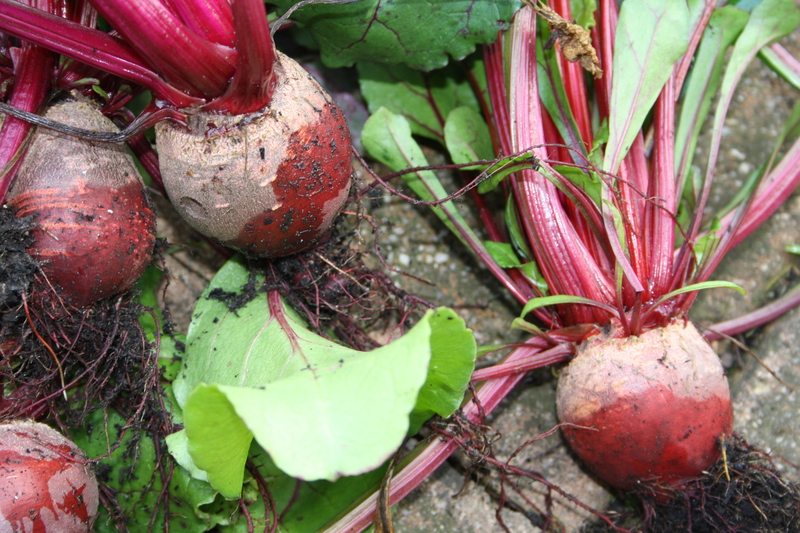 It’s definitely cheaper and if grown right, juicier and fresher than store-bought beetroot, it’s easy to germinate and grow, it grows reasonably quickly (3 -4 months but you can start picking leaves earlier) and lends itself to succession planting, you can grow it almost all year round, and you can use both the root and the leaves. Stephanie Alexander recommends succession planting every 3 weeks. 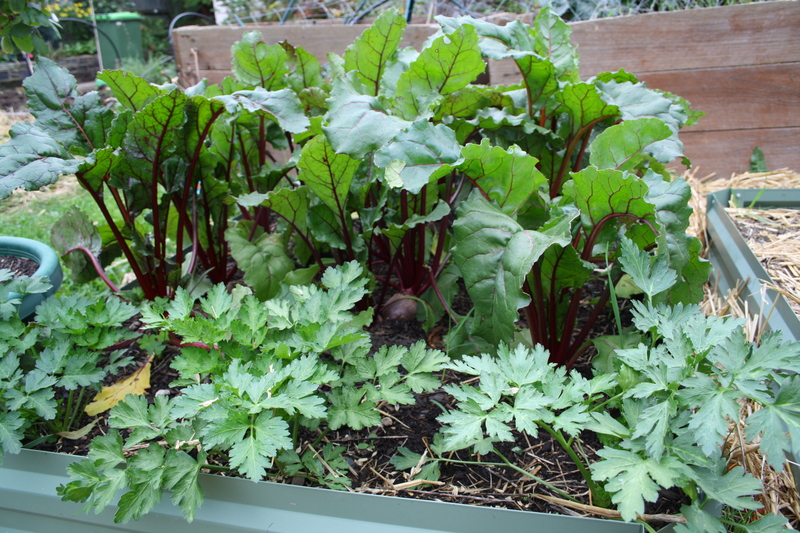 And while I’ve never tried this, my vegie book says beetroot should store well in place in the ground, over winter in cool weather and in well-drained soil. So you should be harvest throughout winter if you’ve planted in late autumn. 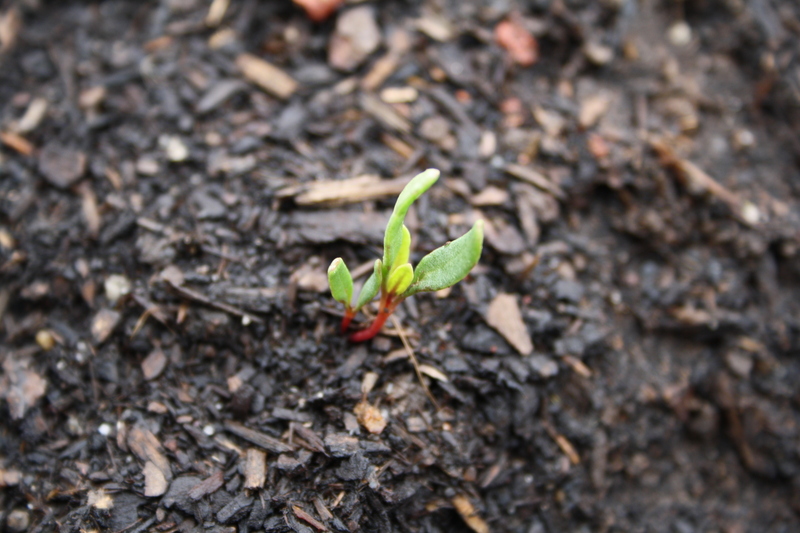 I’m going to plant some seedlings in at this point in late May (the weather is mild until next week, eeek) and see how I go. My book seems to imply it doesn’t like frost but I’ve not ever had any in the ground over winter to observe. I might try using a sort of poly tunnel over my small bed and see how I go. You might consinder growing smaller amounts more often in summer. It doesn’t love hot, dry weather. I think you could also experiment with part-shaded positions (ie. afternoon shade), as root vegies are supposed to be tolerant of part-shade, and that might help prevent woodiness. Not much expertise required here, except to decide what size beetroot you want, and maybe think ahead to the kind of weather you’re expecting and how much water you have. Harvest it before long hot, dry periods as it goes woody and dry inside. My vegie book says to pick them at the size of golf balls. Give it a good wash, cut or twist the tops off above the root with a little stem left at the top, and leave the roots on. You can easily push the skin and the roots and leftover stems off with your fingers after you’ve cooked it and let it cool a little. If you’re going to use the leaves, then don’t pick to meany leaves from one plant. It needs to photosynthesise. Apparently the smaller leaves are nicer in salads, and you can pick bigger leaves for cooking/sauteeing. You can use it every which way, a great crop! Roast in the oven or boil on the stove, or a combination of both. I haven’t used the leaves much at home but always like the young leaves in fancy salads when I eat out. They have red veins and provide a nice contrast to other all green leaves. I’ve had beautiful plainly roasted beetroot as part of a larger dish of roasted root veg at a few places. And I’ve listed the ways I regularly use and enjoy at home below. Eating beetroot raw is suprisingly delicious. It’s also great when you don’t have heaps of time because beetroot can take a long time to cook, depending on its size. 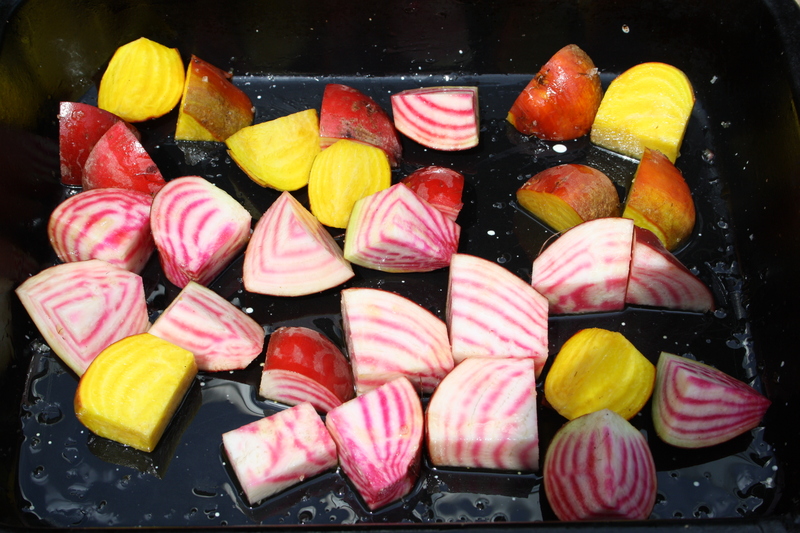 The stripey variety below – chioggia – is surprisingly sweet when raw. Almost like lollies. Couldn’t find a link to this one, so: thinly slice fresh beetroot and a sharp, tasty apple. Arrange on a plate, and crumble over some strong cheddar and toasted nuts (pecans if you like, I’ve used walnuts and almonds). Dress with vinaigrette (I do two parts olive oil, one part white balsamic vinegar, with a bit of salt, shaken in a jar). This is so good. Great way to get some last minute veg into your tummy very quickly. So so good when you need something fresh in winter to break up all the stews and roasts and soups. If you haven’t made labneh just serve it with some seasoned yoghurt as the recipe suggests. 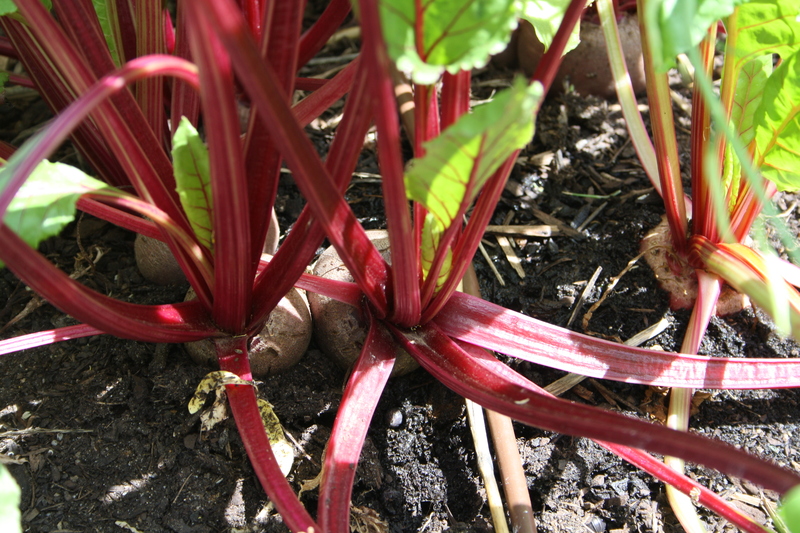 Small beetroots (golf ball size) only take a bout 20 minutes to boil on the stove. They take AGES to roast in the oven, big or small. Factor in this time. Don’t worry if you don’t have zaatar or don’t want it. This recipe doesn’t necessarily need it. You could use other small seeds and crushed nuts to flavour it but I think the yoghurt and maple syrup alone make it delicious. This recipe makes a lot, so be prepared to eat it in a big group or over several days. Don’t worry if you don’t have vino cotto. Just use balsamic vinegar. 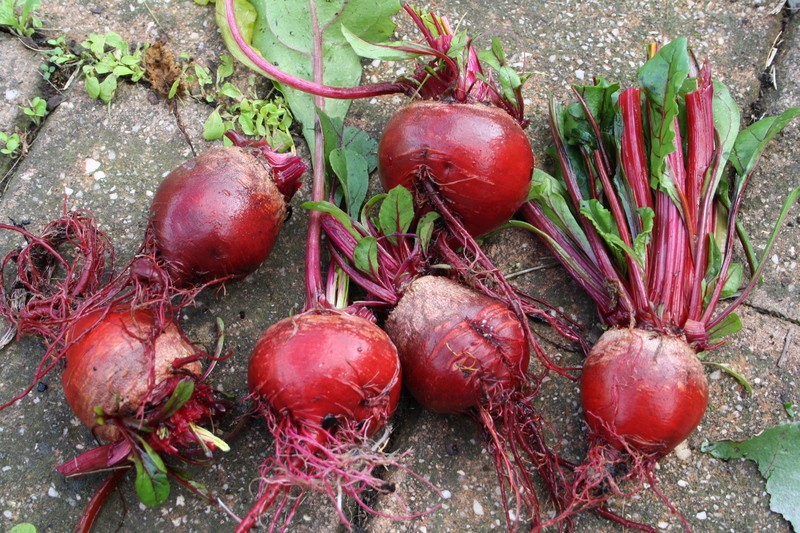 And don’t worry if your beetroots look all shriveled after the roasting. They will be juicy and delicious still inside. You can cover them with foil if you want to avoid the shriveled look. So the flavour of the beetroot in the Nigel Slater cake (link below) is barely perceptible but gives it a lovely colour and texture and the cake is just perfect – not too sweet or rich. Heaven while still warm with creme. Heaven. Good way to use up leftover cooked beetroot too. I don’t know that sneaking vegies into cakes is really a way to reassure yourself that your kid eats vegies… but hey, mine ate this. What are your favourite ways to use beetroot? I give them a really good scrub, wrap them in foil and throw them in a baking dish to roast when I’ve got the oven on for something else. After about forty-five mins they’re usually done in a moderate oven. Let them cool, unwrap, rub off skin, chop and serve warm with other roast veg or use warm or cold in a beetroot, goats cheese and leafy salad (dress with balsamic and olive oil). Finely julienned raw sweet beetroot (not old bitter beetroot) is also yum added to any salad.